These are dark times for democracy. That was the theme of a few speakers at Saturday’s Women’s Summit 2018 who encouraged progressive activists to pull out all the stops to turn the U.S. House and Senate blue in November. Jennifer Wexton, with other Congressional candidates, discusses the importance of defeating Comstock in November. / Photos by Karen Kirk. 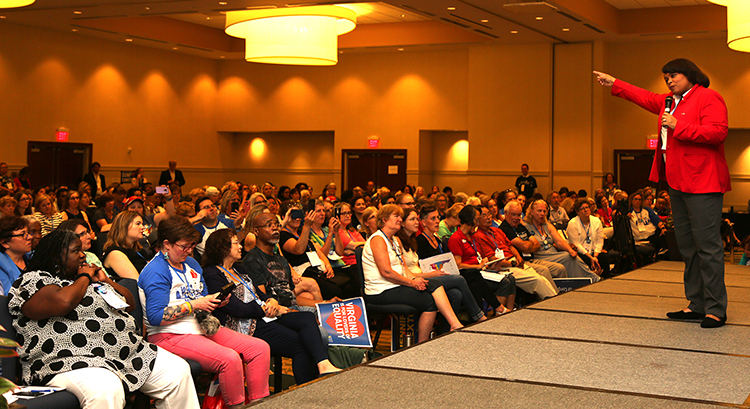 At the sold-out summit in Herndon, activists and Congressional candidates praised the audience, mostly women, for their hard work and success in the 2017 Virginia races, which added 15 Democrats to the state legislature. But they warned that unless there are checks on President Trump, much will be at risk, and there is much work to do for the November election. “Democracy is on the ballot,” said Neera Tanden, of the Center for American Progress Action Fund, in a panel discussion. 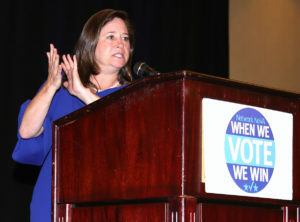 Shelly Simonds, who lost a random drawing to settle Virginia’s 94th District House of Delegates race, reminded people why every vote counts. She announced that she would again be running for the seat in 2019. 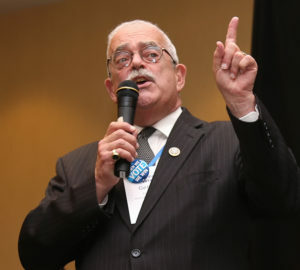 Congressman Gerry Connolly, CD-11, on the important contribution women made in the 2017 election. Their concerns were echoed by Congressional candidates from several Virginia districts, including Rep. Gerry Connolly, CD-11; Jennifer Wexton, CD-10; Anthony Flaccavento, CD-9; Rep.Don Beyer, CD-8; Abigail Spanberger, CD-7; Jennifer Lewis, CD-6; Leslie Cockburn, CD-5; Elaine Luria, CD-2; and Vangie Williams, CD-1. Each candidate briefly addressed the audience, and many remarked on the power that women had in the Democratic success of 2017, when women won 9 Virginia state races. “Now it’s time for Democrats to support black women in politics,” says Susan Otim-Neal. 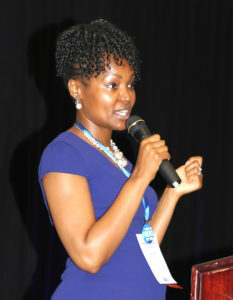 Speaker Susan Otim-Neal of Syncerity Speaks Consulting said that black support has greatly helped Democrats win. “Now it’s time for Democrats to support black women in politics,” she said. Neal also called for more support in the workplace for black women, noting that they are behind economically, earning 65 cents for every dollar white men earn — less than the 80 cents for every dollar that white women earn compared to white men. Otim-Neal, who is pregnant, just found out that she is having a boy. Now she is wondering how to protect her son from “the devastating impact of racism.” “Kids need to be taught about race, racism and white privilege,” she said. “Transform racism within yourself, your family and those you are close to. When white people show up on racism, things will change.” Otim-Neal got a standing ovation. Besides speakers and panels, 23 breakout sessions were offered at the summit at the Hyatt Regency Dulles. Congressional district rooms and advocacy fair exhibits were also featured. The summit was presented by Network NoVA, which held its first Women’s Summit last year and is already planning the next one. Photo above story is of Vangie Williams encouraging the audience to donate to all the Democratic candidates. Williams, a strategic analyst for a federal contractor and mother of six, is challenging Republican Rep. Rob Wittman, CD-1, in November. 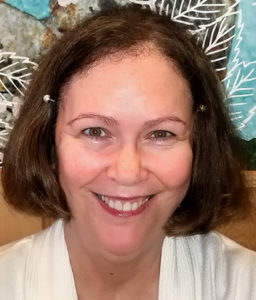 Karen Kirk is the Deputy Editor / Photo Editor of The Blue View and a retired journalist.